So, on a road trip for beer with my buddy Jim yesterday, we stopped in Woodbridge, NJ, at a Pizzeria Uno. What was strange about this Pizzeria Uno is that it made beer. According to our charming bartender, Elena (I could be spelling that wrong), there once was a corporate dream at the central Uno offices of a franchise of pizzeria/brewpubs. Then they realizes how much mashtuns and fermenters cost, and they scrapped the idea. But before they did, they launched one brewpub, in New Jersey, where it remains. And apparently, they paid a marketing firm to make logos and all sorts of crap for their beers. 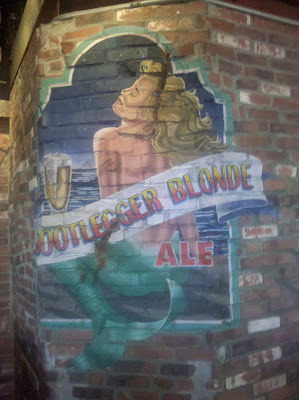 Below you can see the image for the Bootlegger Blonde repurposed as a wall mural. Though I was warned off the Blonde as a beer too light to follow the delicious pale bock, I was able to have one of Ike's IPAs. 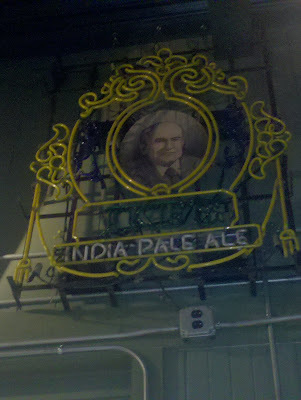 Ike is apparently the founder of Uno from back in the day, and it is with his visage that corporate branded the beer. And created neon fixtures. I seriously wonder if there's a huge warehouse somewhere of all the marketing products Uno commissioned to market their beer. The work is pretty good, if understandably a bit bland. And the neon lights are pretty damn intricate.